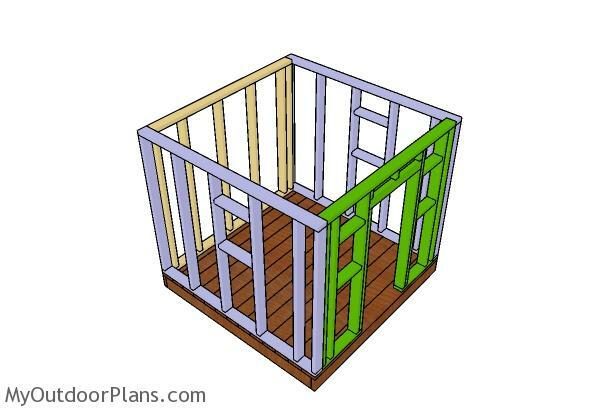 This step by step diy project is about free 6×6 playhuse plans. 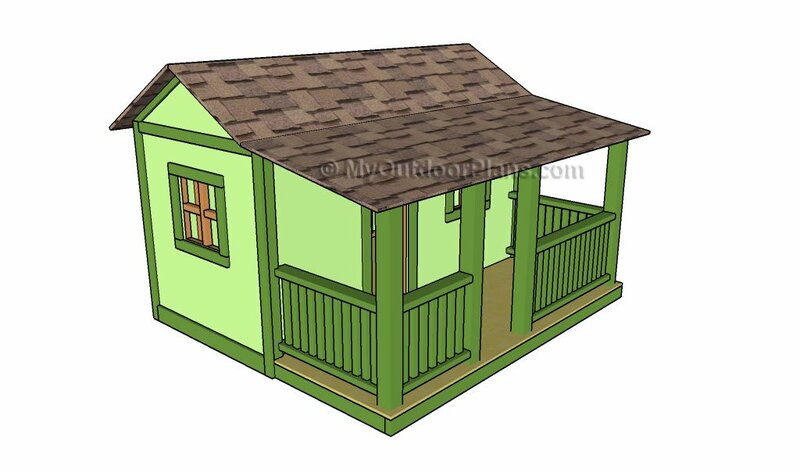 I have designed this 6×6 playhouse with a gable roof so you can finally build that amazing gift for your kids. 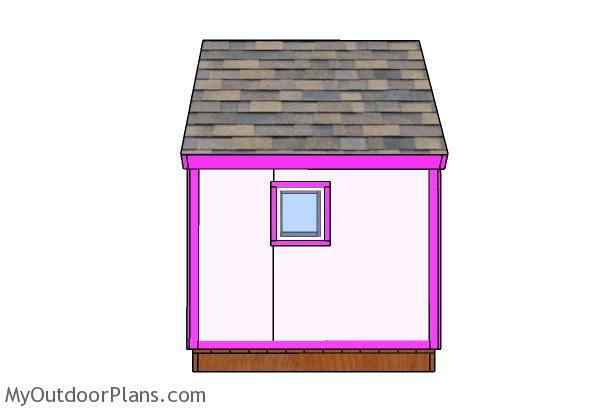 This playhouse has a gable roof for an elegant look and so you can make it waterproof. Take a look over the rest of my woodworking plans, if you want to get more building inspiration. The first step of the project is to build the floor of the playhouse. 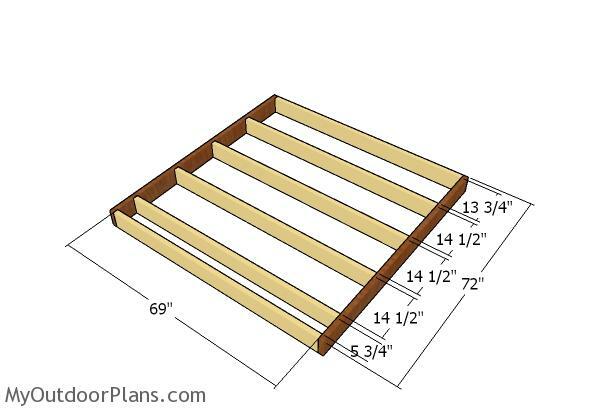 Cut the joists from 2×6 lumber and lay them on a level surface. Drill pilot holes through the rim joists and insert 3 1/2″ screws into the perpendicular beams. Make sure the corners are square and align the edges flush. Fit the 2×6 beams to the floor frame and align the edges flush. Drill pilot holes through the decking boards and then insert 2 1/2″ screws to lock them into place tightly. The nest step of the project is to build the back wall frame for the playhouse. 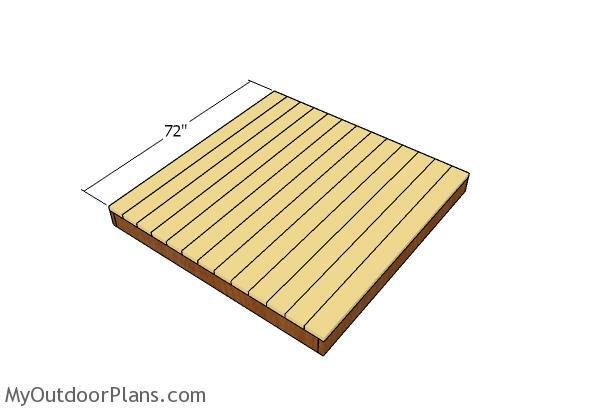 Cut the components from 2×4 lumber as shown in the diagram. Drill pilot holes through the plates and insert 2 1/2″ screws into the studs. Place the studs every 16″ on center, for a professional result. Assemble the front wall for the simple playhouse using the same techniques described above. You need to leave a door opening so you can seal the playhouse during the cold season and during the nights. Moreover, you can frame windows to the front wall of the playhouse, to let a lot of light inside. 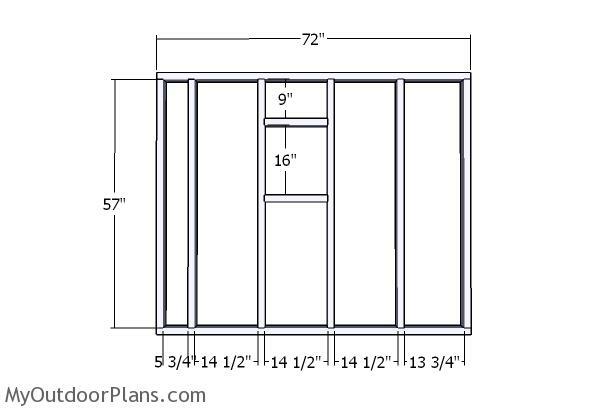 Frame the side walls for the kids playhouse. 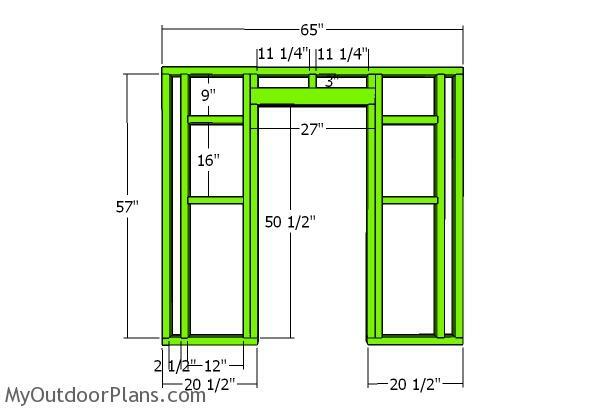 Frame a window and adjust its size to suit your needs. Fit the wall frames to the floor of the playhouse. Align the edges flush and plumb the walls with a spirit level. Drill pilot holes through the bottom plates and insert Moreover, you need to lock the adjacent walls together tightly. Drill pilot holes and insert 2 1/2″ screws to lock them into place tightly. 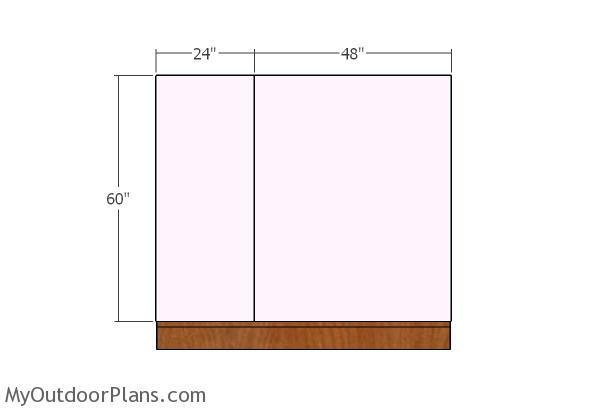 Cut the panels for the walls from 1/2″ or 3/4″ plywood. 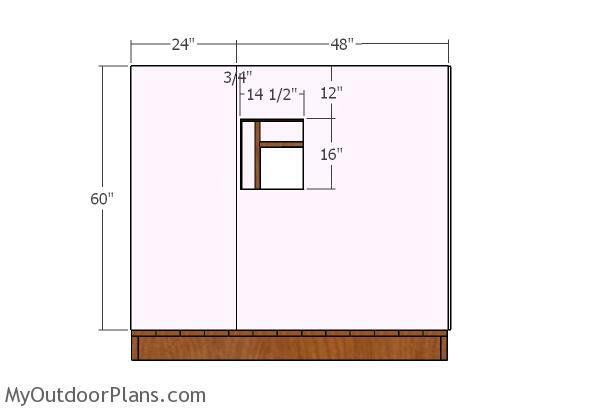 In these plans I have designed everything based on 3/4″ plywood, so if you choose to use thinner plywood, you will need to make some adjustments to the size of the trims. Adjust the edges flush before inserting the 6d nails, every 8″ along the framing. Fit the panels to the front of the playhouse. 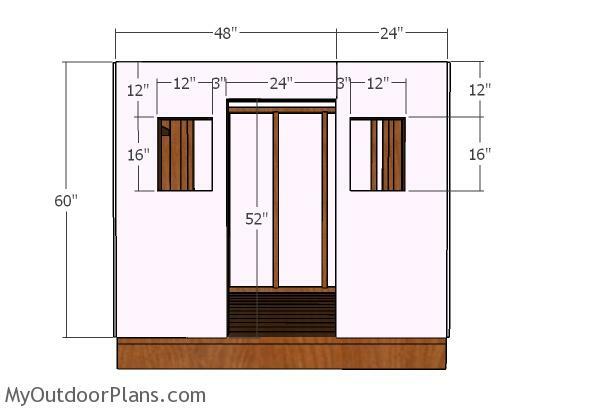 Make the cuts to the panels so you can create the door and the window openings. 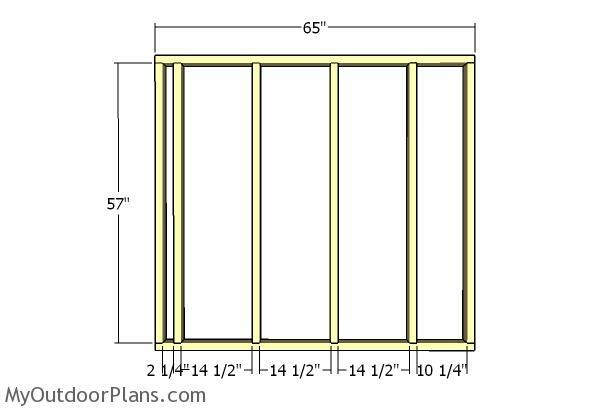 Use 6d nails to lock the panels into place, every 8″ along the framing. Fit the panels to the back of the playhouse, as well. Leave no gaps between the panels and then insert the nails. 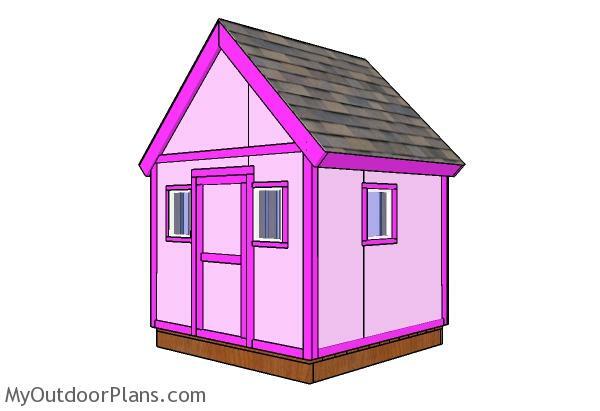 You really need to take a look over PART 2 of the playhouse project, so you learn how to build the gable roof and how to fit the decorative trims into place. This playhouse is really easy to build, if you have basic tools and you know some woodworking techniques. Make sure you take a look over the cut list, so you can get the job done in a professional manner. 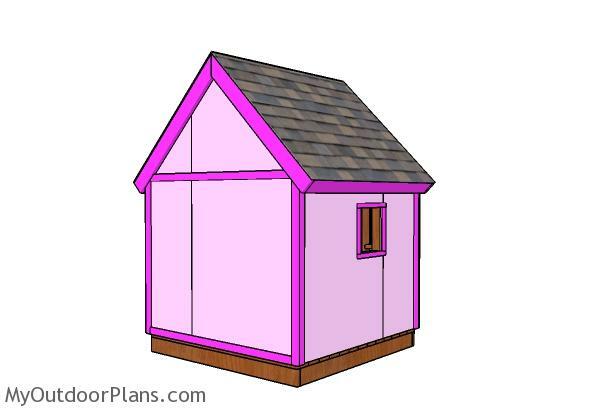 This playhouse has a simple design, but it will keep the costs down and help you save money. Moreover, this project will give you the necessary confidence to tackle other projects. 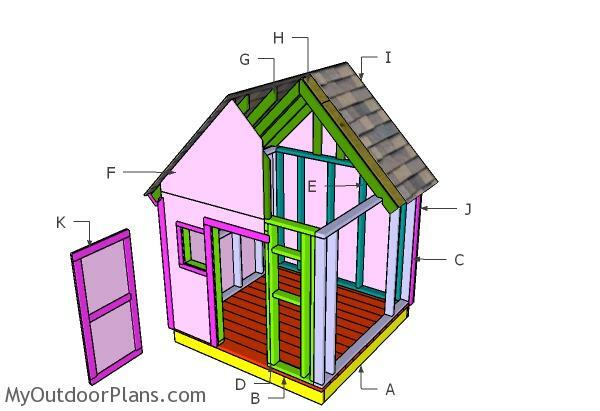 This woodworking project was about 6×6 simple playhouse plans free. If you want to see more outdoor plans, check out the rest of our step by step projects and follow the instructions to obtain a professional result.